The Capital One Quicksilver Cash Rewards credit card is a good option for saving on interest, due to a long 15-month 0-percent introductory APR on balance transfers and new purchases. Before you apply for the Capital One Quicksilver Cash Rewards Credit Card, you should ask yourself: What kind of cardholder am I? Are you someone with good to excellent credit, who pays bills on time, but has little time or patience for credit card upkeep or for juggling more than one card at once? Or, are you willing to pour time into your cards to earn extra cash back? The Quicksilver card’s earning scheme is designed for users who prefer simplicity rather than for maximizing value. You earn unlimited 1.5 percent cash back on every purchase – no more, no less. This is a great option for a cardholder who wants a low-maintenance rewards card it, but it gives you no options for strategizing and boosting your cash back earnings. Furthermore, there is a slew of cards that reward 1.5 percent back on every purchase. Aside from the simplicity of its redemption options (more on that below), the Quicksilver card doesn’t offer much to distinguish it from other flat-rate cards. And, frankly, there are flat-rate cards with an even higher rate of cash back, including the Citi Double Cash Back Card, which offers up to 2 percent cash back – 1 percent when you make a purchase and 1 percent when you pay on time. The Quicksilver card offers $150 to new cardholders who sign up and spend $500 on the card in their first three months of card membership. While this is a nice added incentive for new cardholders, it’s a very average offer, matched by many competitors. If you are looking for ultimate ease, redemption is where the Quicksilver card has the edge. Your cash back never expires, you can redeem any amount of cash back at any time and Capital One gives you multiple redemption options, including statement credits, checks, gift cards and more. You can also issue your cash back as a check – but the purchase eraser makes things so easy, it’s probably not worth the extra effort in most cases (though it’s nice to have the option in case you want to close your card and cash out your rewards). Note, Capital One also advertises an automatic redemption option for cash back on its site. 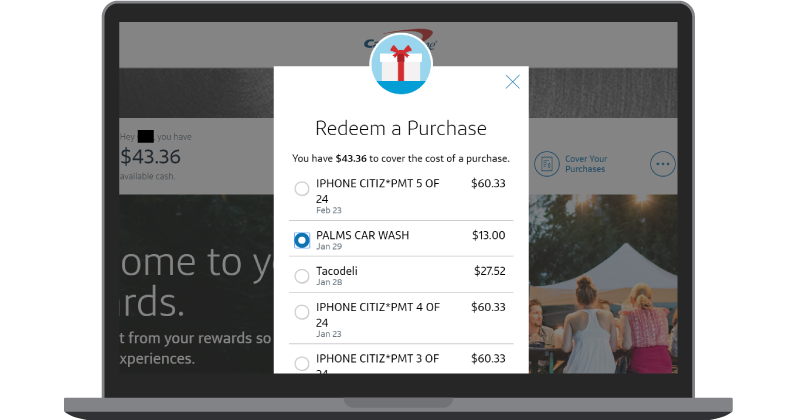 However, Capital One recently removed the feature that allows you to set your rewards to redeem automatically in your online account. You’ll have to call a representative to set up an automatic redemption, as well as to make updates to your redemption amounts – not very convenient! Tip: The Quicksilver card is a true cash back card and does not earn Capital One miles. If you’re hoping to earn flexible, transferable miles, you should check out Capital One’s list of miles cards. For cardholders who need to transfer a balance from another card, the Quicksilver card could be an attractive option. The card offers a 0 percent introductory APR on balance transfers for the first 15 months of card membership, and 16.24 to 26.24 percent thereafter. Though you can find cards with much longer intro periods (as long as 24 months), with the Quicksilver card, you will have an appealing card with a good cash back program that you can continue using once your balance is paid off. On the downside, the Quicksilver card charges a 3 percent fee for balance transfers. If you want to save the most money on your balance transfer, you should check out a card with a 0 percent fee for balance transfers. You should also note that the Quicksilver card charges a fairly high APR. You’ll need to be certain of paying off your balance in time to avoid being hit with interest. Otherwise, you may be better off searching for a balance transfer card with a lower APR. Tip: If you’re considering making a cash advance with the Quicksilver card to pay off a debt, be forewarned that the costs are high. You will be charged a 3 percent fee, and you’ll immediately start accruing interest with an APR of 26.24 percent. Consider using the Quicksilver card’s balance transfer option to avoid paying interest on your debt off the bat. The Quicksilver card also offers a 0-percent introductory period for new purchases for the first 15 months of card membership (16.24 to 26.24 percent APR thereafter). This a handy option for new cardholders who want to finance a large purchase at 0-percent, as well as cardholders who want the option of a transferring a balance to the card and adding to that balance without collecting interest on their new charges. You’ll want to be sure to pay off your statement in time each month with the Quicksilver card. While the card, fortunately, does not include a penalty APR, it does come a higher-than-average regular APR and a $38 penalty for late payments. If you send in a payment past your due date, you will owe interest on your balance plus a late fee. 24-hour travel assistance – If your card is lost or stolen on a trip, you can get an emergency replacement, plus a cash advance. Auto rental collision damage waiver – Capital One covers eligible car rentals for damage due to collision or theft. The insurance is secondary, which means it only kicks in for damage not covered by another policy. Travel accident insurance – The card offers up to $250,000 in insurance for accidental death or dismemberment on a trip purchased by the card. Extended warranty – You get an extra year of warranty on eligible items purchased with your card, for warranties of three years of less. Premier access – Card membership entitles you to VIP access to a limited selection of dining, sporting and music events. CreditWise – Capital One’s CreditWise service monitors your credit for free, including credit report and SSN alerts. The CreditWise service is a fairly unique feature. While most issuers offer free credit scores, Capital One’s free email alerts could come in handy for cardholders keeping close tabs on their credit scores. Capital One recommends the Quicksilver card for customers with good to excellent credit (a score of 670 or higher). The lower you fall along this spectrum, the lower your chances of approval (around 58.7 for consumers below a score of 719, according to a recent survey by the Consumer Financial Protection Bureau). You must also be a U.S. resident with adequate income (at least $425 more than your rent or monthly mortgage payment) with no overdue amounts with Capital One. Capital one may decline you if you have applied for a Capital One card at least twice in the past 30 days, or if you have five or more cards open with Capital One. If your credit score doesn’t meet the threshold for the Quicksilver card, Capital One offers two excellent cards that can help you build credit: the Capital One® QuicksilverOne® Cash Rewards Credit Card and the Capital One® Platinum Credit Card. 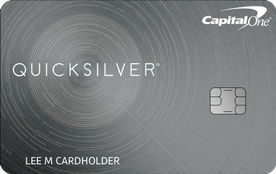 The Quicksilver card is issued by Capital One, which has a good, though not great, reputation with its customers. Capital One scored an 803 on the 2018 J.D. Power Credit Card Satisfaction Study, putting it in fifth place out of 12 major issuers. The bank offers round-the-clock live customer service for credit card customers and includes an online chat service on its website (you may have to do some searching to locate it), making it easier to get ahold of an agent when you have a problem. Furthermore, the Capital One mobile app rates very well with users, scoring a 4.7 out of 5 on the Google Play Store and 4.6 out of 5 on the Apple Store. How does the Quicksilver compare to other cards? 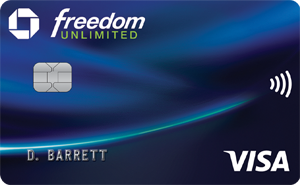 The Chase Freedom Unlimited card is another simple 1.5-percent cash back card. It offers similar flexibility as the Quicksilver card – you can redeem any amount of cash back at any time for a variety of rewards, including merchandise and statement credits. However, the card has an additional feature that gives it an edge: You can transfer your rewards as points to certain premium Chase cards. The Chase Sapphire Preferred Card gives you a 25 percent bonus on points when you redeem them for travel, and the Chase Sapphire Reserve card gives you a 50 percent travel redemption bonus. These bonuses can potentially boost the value of your rewards by 25 to 50 percent. Plus, the card comes with a unique introductory offer that can be more lucrative in the first year. Rather than a flat cash bonus like the Quicksilver, the Freedom Unlimited card lets users earn 3 percent cash back on up to $20,000 in purchases in the first year (1.5% thereafter). If you max out the spend cap, you could bring in $600 in rewards in the first year alone. For cardholders who don’t mind a bit of card maintenance, the Discover it Cash back lets you earn a little more on your spending thank to its 5 percent rotating bonus categories. You have to activate the categories each quarter to earn the bonus, which is capped at $1,500 in purchases per quarter (you earn 1 percent on all purchases thereafter). Despite the spending cap, you can earn more rewards with the Discover it Cash Match card just by putting all your purchases on one card. We figure that a cardholder who spends an average amount in the Discover’s 2019 bonus categories can earn 1.58 percent cash back per dollar spent, beating the Quicksilver card’s 1.5 percent cash back rate. Also, Discover matches your cash back in the first year of card membership, basically doubling all your earnings for that year. 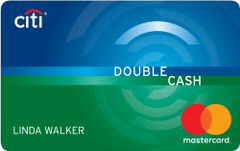 If you want to boost your cash back earnings even more, you can pair the Discover Cash Match card with a flat-rate card that earns a higher rate on general purchases (including the Quicksilver card) and dedicate your Discover card to purchases that earn a 5 percent bonus. Why get the Capital One Quicksilver card? You prefer earning cash back over earning credit card points. You want one of the simplest cash back rewards programs available. You want to earn a high rate of cash back on all your purchases without having to rotate cards. You want a good flat-rate card to pair with a bonus category card. You’re searching for a no-annual-fee card without a foreign transaction fee. Use it as your go-to card to pay for all your purchases or rotate it with a card with bonus categories, using the Quicksilver card to pay for purchases that don’t fall in a bonus category. Make sure you spend $500 in the first three months to earn the sign-up bonus. Use the card to transfer a balance or finance a large purchase for 15 months of no interest. Pay off your balance in full each month to avoid the card’s high interest rate. Use the card while traveling abroad or for purchases from foreign sites – you won’t be charged a foreign transaction fee. Use CreditWise to monitor and improve your credit score. Is the Quicksilver card worth it? For a cardholder who prefers the utmost simplicity and wants to earn a steady rate of cash back without much thought, the Quicksilver card is one of the best options. However, if you want to maximize your rewards earnings, there are many other cards out there with much higher earning rates. Before you apply for the Quicksilver card, you should take a look out the full array of cash back cards to make sure you aren’t missing out on a better value.